Each year the Peace River freezes over through the Town of Peace River, generally it freezes and thaws with little impact on life in Town, however, it is important for residents to be aware of the process and what is happening. Sometimes due to weather, freeze up, or break up does not go smoothly. This can cause river levels to rise and increase the potential of a flood or groundwater seepage. It is important to know the Town of Peace River works very closely with the Province of Alberta’s river forecasting centre and through a committee, that includes the Province of British Columbia and BC Hydro, we are able to keep tabs on river activity. The last of the upstream ice released and passed through town on Sunday, April 14 without any issue. The Peace River at the Town of Peace River is completely broken up ending the break-up season at the Town of Peace River. Additional information including reports, observation maps and satellite images, are available from Alberta Environment and Parks at: https://rivers.alberta.ca/. Freeze Up of the Peace River at the Town of Peace River typically takes place in mid-January. It begins when sustained cold temperatures cause ice to form, that ice flows downstream until it fills the river jamming it up. The ice plus the cold water causes the water to slow and ice to continue to build. That process continues until the river is completely frozen. The Town of Peace River begins keeping an eye on ice reports and weather patterns in early-December. When the leading edge of the ice pack, called the ice front, is within 30km of the Town of Peace River our Public Works crew begin ice watch. Ice watch is a way we complement the forecasting provided by the Province, while forecasting is based in hard science, it involves making predictions with a number of unknown or estimated values, for that reason the Town of Peace River and Government of Alberta view seven days as the upper limit for accurate river forecasting. Additionally services like the data available at rivers.alberta.ca or through the Alberta Rivers app provides excellent insight into the river, however, the instruments are susceptible to error from time to time. That’s why the Town ensures there are people visually confirming the status of the ice pack and the security of our anti-flood measures. In advance of the river freezing up through Town, BC Hydro regulates the flow coming out of the W.A.C. Bennett Dam. It takes just less than two days for the changes to impact us. 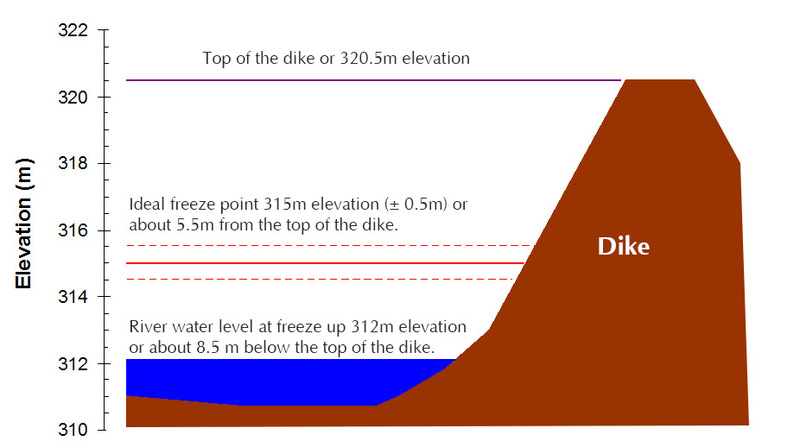 The regulated flow helps to bring the water level down to 312 metres elevation or about eight and a half metres below the top of our dike system. By doing this the river will freeze at around 315 metres elevation or about five and a half metres below the top of the dikes. What freezes must thaw, and so each year, typically around Easter, the Peace River thaws at the Town of Peace River. The process is the same as freeze up only in reverse. During that time the Town keeps an eye on not only the Peace River, but the Smoky, Heart River and Pat’s Creek. 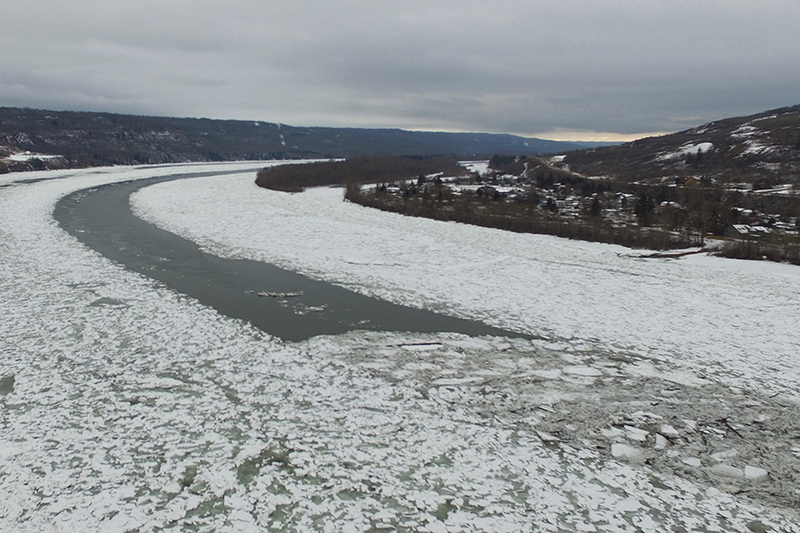 The leading edge of the river thaw passes through Peace River in early March 2016. That year saw a late freeze up and early thaw, it took less than a day for the ice pack to recede past the town. If there is ice on the river, stay off it. Each year emergency workers get called to respond to reports of people on or near the ice flows, these are very dangerous situations that put both the person on the ice and the first responders at risk. Our fire department trains for ice rescues, but they’re skills we would rather not need to use. There is no reason to be on the ice during freeze up and so we ask for everyone’s safety and security that people refrain from going on or near it. In the Lower West Peace neighbourhood a number of homes are built with basements below the level of the riverbed. In the past this has presented a challenge for homeowners during freeze up and particularly breakup with occasional groundwater seeping into foundations and basements. In 2016 BC Hydro completed a dewatering system in Lower West Peace that should make groundwater seepage a thing of the past. When water begins seeping a number of underground wells and pumps kick into action which draw the water into the wells before pumping it into the river. There is always a risk of flooding when the river begins to change. This process is heavily monitored by the Town and Province to ensure residents are kept up-to-date on any potential flood risks. If the water does rise within three and a half metres of the top of the dike the Town of Peace River will issue a green alert to warn residents to take necessary precautions. If an alert is issued info will be prominently posted on the Town’s website and social media pages, local media (KixFm and YLCounty) will also broadcast updates every 15 minutes or so. For more info on Town emergency procedures, alerts and how to be prepared in the event of an emergency please visit our emergency preparedness page. Information and efficient accurate communication can help people remain calm during this time. In the event of an emergency it helps to ensure accurate information is relaid. During the ice season (December to April) the Town of Peace River will republish ice observation reports from Alberta Environment and Parks on our news section. You can be alerted every time we post a news post by subscribing to our RSS feed. Through the river forecasting centre the Province of Alberta monitors all rivers, flow and ice pack. This information is available at rivers.alberta.ca there is also an app available by searching “Alberta Rivers” in either the Apple iTunes store or the Google Play Store that contains the same info. Please note: while forecasting is based in hard science, it involves making predictions with a number of unknown or estimated values, for that reason the Town of Peace River and Government of Alberta view seven days as the upper limit for accurate river forecasting. Additionally services like the data available at rivers.alberta.ca or through the rivers app provides excellent insight into the river’s current state, however, the instruments are susceptible to error from time to time.